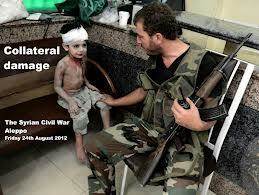 The civil war in Syrian, which began in March 2011, drags on with all its madness and no end in sight. In that time, 125,000 (latest figures) have died and 2 million of Syria’s 6 million population fled, spilling its human burden into refugee camps in Lebanon, Jordan, Turkey and Iraq. All wars are destructive, but civil wars usually are among the worst. In our own civil war, 600,000 died, which is more than all our wars combined; more than a million perished in Spain; 2 million in Algeria and Korea. One of the worst scenarios missed by the media is the loss of 5 million lives in the Democratic Republic of the Congo between 1998 and 2008. The present conflict proves no exception. While we normally associate casualties with the military waging war, the truth is that civilian casualties nearly always exceed military losses by a wide margin; for example, an estimated 20 million European civilians died in World War II. More than half of 70,000 families now without a father. 4000 children separated from their families. Hundreds of children born in refugee camps stateless (unregistered births and no birth certificate). Most children cut off from school. All wars are tragic enactments of the primordial vestiges still resident in Man. This conflict, however, has seen some of their worst manifestations, with children deliberately targeted by sniper fire and even tortured. Horrendous as all of this is, no one seems to have come-up with a chokehold to halt the carnage. Maybe it’s too late anyway in a struggle that seems to have come down to attrition. While the Assad regime has gained momentum lately against the rebels, the war has become more complicated with jihadists, including al Qaeda, pouring in from other nations. Increasingly, the struggle has turned sectarian, with Shiites pitted against Sunni. It’s Iraq all over again with long term, intractable violence the likely fallout even after any settlement is reached. In my view, it needn’t have turned out this way had we armed the moderate rebels from the beginning, even as the Saudis had wanted, and before the entrance of Iranian-supported Hezbollah and al Qaeda in large numbers. While the Obama administration finally did opt to supply at least light arms to the rebels, it turns out that after a year it hadn’t shipped any. It’s simply too late to help now, since the old alibi that weaponry might fall into extremists hands has gained a validity that didn’t initially exist. We have communicated in no uncertain terms with every player in the region that that’s a red line for us and that there would be enormous consequences if we start seeing movement on the chemical weapons front or the use of chemical weapons (August 2012 News Conferences). Then came his notorious aborted cruise missile launch in response to Syria’s calling his bluff with its chemical assault on civilians, resulting in a thousand deaths. As it turns out, there had been previous, smaller scale chemical attacks and the President had not acted. In mid stream, naval vessels off the Syrian coast ready to launch, the whole world watching, he did an about face, passing the puck to Congress, only to withdraw the vote option when Russia came up with its initiative to negotiate the destruction of the government’s chemical stockpile with Assad. Got Obama off the hook, to say the least. Imagine my surprise in all of this! A Hamlet in the White House, this president suffers from an inability to act. We should have seen this coming. In election year 2012, he had the gall to use the bin Laden hit for political fodder, though the truth is he knew of bin Laden’s hideout since the summer of 2010, or nearly two years earlier, thus risking his escape. As liberal Arianna Huffington shared with CBS: ‘We should celebrate the fact that they did such a great job. It’s one thing to have an NBC special from the Situation Room… all that to me is perfectly legitimate, but to turn it into a campaign ad is one of the most despicable things you can do” (Daily Mail). It turns out that the White House had drawn up a contingency plan with a general for a fall guy should the assassination go awry. I don’t think you draw a line like that, that is not well thought out. You do not say, ‘If you step across this line, we will commit U. S. Military force,’ unless you really mean it, unless you know the full implications of it. Under the cover of the chemical weapons agreement things have gotten considerably worse for the rebels, with Assad’s forces launching daily bombing raids on the rebels and civilians in the areas they control. Sadly the American public seems in lock-step with Obama, despite dissenters on his own White House team. If you dip into Google and Twitter commentary, you’ll find Syria virtually absent as a search or discussion item. We’re much more into Miley Cyrus. While someone else is eating or opening a window or just dully walking along. I think of Syria’s children. This entry was posted in Politics, Reflections and tagged Al Qaeda, Assad, Barack Obama, Bashar al-Assad, Obama, Syria, White House, World War II. Bookmark the permalink. I like the valuable information yyou provide in youhr articles. I’ll bookmark your weblog aand check again here regularly. I am quite certain I’ll learnn many new stuff right here!